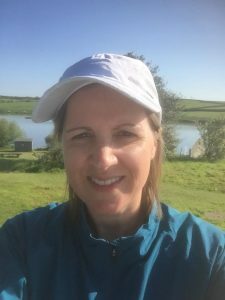 Having failed to get through the general ballot for the London Marathon, Okehampton Running Club member Monika Richards took up the offer from the Edinburgh Marathon to give a guaranteed place to those who had been unsuccessful for London. This was to be the first marathon for Monika and is an ideal choice with a fast flat course and plenty of support throughout the race. The day started cool and misty but cleared to sunshine during the race and despite its coastal location, the wind was not an issue. Monika had a terrific run and was more than happy with her finishing time of 4.01.03. Three Okehampton runners attended the Chagford Two Hills race on Bank Holiday Monday. Deborah Cunningham, Alec Robinson and Robert Richards, Robert was accompanied by his eldest son Matthew, who is a veteran of this event. The event runs every year from the Memorial grounds in Chagford and take runner up two very steep hills, Meldon Hill and Nattadon Hill, in total a 1076 feet climb. Although the distance is short, only 3.5miles it is regarded as a rather tough event. Those newcomers to this event are always made aware of the infamous bog that hovers between the two hills. Suitably placed to sap any last remaining energy from you just before you ascend up the second hill. No official times are available but Alec was first in with a time of close to 35mins, followed by Robert in a time of 40mins and Deborah third in just under one hour. 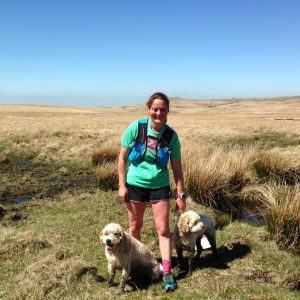 Three more Okehampton runners took on the Dartmoor 600s Challenge last Sunday. 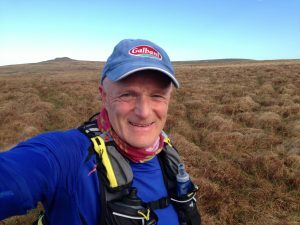 This is a self-navigating run of approximately 19 miles to complete all five of the Dartmoor peaks over 600m – Cut Hill, Whitehorse, Hangingstone Hill, Yes Tor and High Willhays. For Jane Jackson and Mags Jarvis this was the first time they had attempted it, while Christine Fristch had already completed it twice, but having done the previous two in an anti-clockwise loop, this time chose to do it clockwise, leaving some of the tougher going to the later stages. Unfortunately Christine’s knee started to hurt after about six miles and got progressively worse, so most of the second half was walked, finally completing it in 5hrs 23min. Thank you as always to Jane Jackson for the reporting and Robert Richards the publishing. 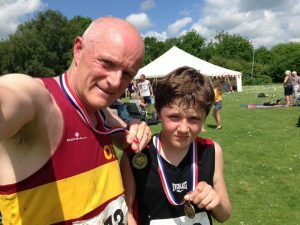 It was a busy weekend of races for the Okehampton Running Club and a very hot one too for racing. 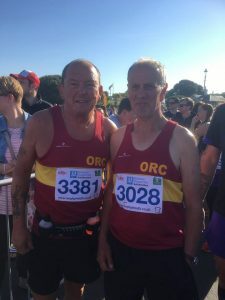 We had runners featured at The Ocean City Plymouth Half Marathon, Exeter Marathon, The Crediton Crunch, The Crystal Palace Chase, the Tavy 5kool 5k and Tamar lakes park run. A popular race this weekend was the Crediton Crunch where four runners took part in the multi-terrain race organised by Crediton Running Network in aid of the charity Hospiscare. At just under six miles the course is quite a hilly one along quiet country lanes, footpaths and strangely includes an off-road motocross course within it, but at least the ground had dried out so much with the recent dry weather there was no mud for once. Alec Robinson was the first home in 43.59, followed by Jo Page on her weekly race in 48.00. Tom Andrew struggled with the heat finishing in 52.06 with Caroline Wilson coming home in 1.04.41. At the Ocean City Plymouth Half Marathon six runners took to the city streets where there was very little shade, but luckily an early start meant it was perhaps not quite as uncomfortable as it could have been later on. First home for the club was Hayden Bond, continuing his improvement since joining the club to set a new personal best of 1.33.47. Gaz Williams was next, running a great race to finish in 1.58.35, spot on the pace he had aimed for. Very close behind was Mike Westland in 1.58.42, followed by a relative newcomer to the club although not to running, Paul Evison, whose time of 2.00.56 was a new pb by 5 minutes. As one of the older newcomers, being in the MV60 category, he was pleased to find that running with the club has improved his times. Cam Whitelaw was slightly disappointed with his time of 2.11.31 despite the fact that this was a marginal pb, but he didn’t enjoy the hot weather today, nor did Daniella Bryant who finished in 3.01.01. 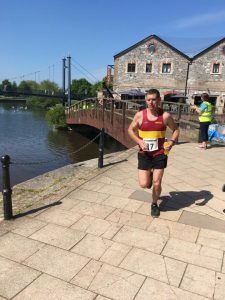 At the Exeter marathon there was also no escaping the sun where the fast and flat three lap course is mainly on the paths and cycleways beside the canal and River Exe. Here seven runners were flying the flag for Okehampton, with some very good results, especially given the heat. Veteran Paul Carter, who has been in consistently good form for some time was the first home in 3.07.45 to be 2nd MV50. Andy Vallance had a very good run too finishing in 3.11.33 ahead of Roger Voaden in 3.15.14. Just one runner separated Roger from Hugh Robinson, who has struggled with an injury in the later stages of his training and was therefore very happy to finish fairly comfortably in 3.15.47. Andy Thorne was the next home in 3.55.42 followed by Anne Binns who bettered her own club age category record by finishing in 4.06.25. 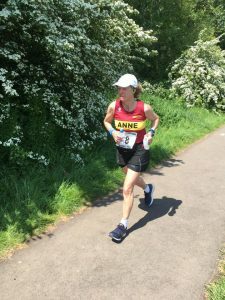 Anne has been plagued by health problems which has affected her training through recent races and this was the first time she has returned to her more usual performance. Geoff Hill has had more injuries than periods of training in the last year, recently winning the club’s prize for the most injured runner at the awards evening where he was presented with an inflatable walking frame! This might have proved useful on Sunday, where, determined to claim the medal and T shirt he’d paid for in the entry, he completed the course in 4.42.17, 1hour 22minutes slower than his pb, but pleased he didn’t feel any the worse for it. 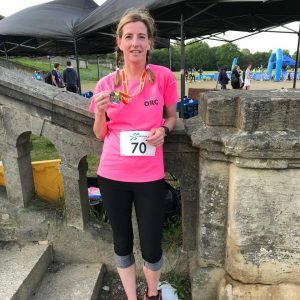 Earlier in the week Jo Bradford was up in London and, following her excellent pb at the Bideford 10k on the Sunday, she decided to have a go at her 5k time. She entered the Crystal Palace Chase the Sun 5k where she had another great run, setting a new pb for this distance by coming home in 23.43, to be fourth female. 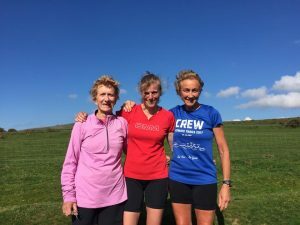 Two Okehampton members took part in 5k races on Saturday morning with Mags Jarvis running the Tavy 5kool 5k and new member Jo Drew trying out her first Parkrun at the Tamar Lakes. Jo had only joined the club very recently, having done some running on her own and completed the Run in the Park a couple of times, so was very pleased to set herself a new pb of 32.38. Mags improved on both her 5k runs last year to get her diamond award, finishing in 26.00 at the monthly 5kool race in Tavistock. Last week Katie Littlejohns took part in the Race the Tide organised by Puretrail Running. There are there distance options here, all being over the standard category distances, with a Long Marathon (29 miles), a Long Half Marathon (16 miles) and a Long 10k, which is actually 14k. Starting at Mouthcombe and running through the beautiful Flete estate, it involves two estuary crossings where they have to beat the incoming tide. Katie had a great run, finishing the 16 mile “Half Marathon” in 2.22.26 to come 3rd Lady and 11th overall. As usual, the Club had a good turnout of runners at the Bideford 10k on Sunday. For once there were near perfect conditions at this popular race that takes the runners from the start on the Quay out to Instow along the road, returning to Bideford via the Tarka Trail with a final sprint back along the Quay. The fast and flat nature of the course has made this an excellent opportunity for personal bests and several runners produced their fastest 10k times so far here. First home for the club was Andy Vernon with a great run to finish in 39.57, coming third in the MV50 age category. 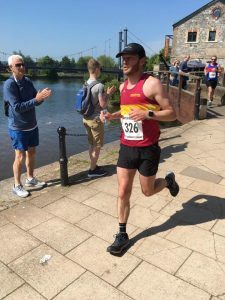 Not far behind him was relative newcomer Hayden Bond, improving on his time he set at the Newport 10k two weeks ago in a great time of 40.35, with Graham Bryant next in 42.08. Despite having run marathons and even an Ultra marathon Graham has never tackled this shorter distance before. Jo Page, now a well established racing machine in the club having run a race nearly every week since joining, was the first ORC lady home to clock another PB in 45.54, still improving with every race. Tom Andrew, winner of the Best Newcomer Award on Friday, proved himself a worthy winner by producing a PB here, coming home in 48.22, with Karen King, another first timer at this distance next in 48.42. Jo Bradford, winner of the Most Improved Female Award, showed she has every intention of continuing to set herself new targets and keep improving with a great run here, finishing in 49.07. Having initially aimed for 51minutes this gave her a new PB by over 4 minutes. Not far behind, having shadowed Jo for most of the race, was Jane Jackson, taking a weekend off from her Ultra marathon training to give her legs a rest after the Hartland Hartbreaker the week before. Jane finished in 49.37 to come 3rd FV60 and attain her platinum award. Gaz Williams was also a first timer over the 10k distance and had a very good run to finish in 53.06, well inside the time he’d thought he’d achieve, while Jo Burrow is improving all the time and was very pleased to come home in 57.38 to get on the awards chart for the new season. 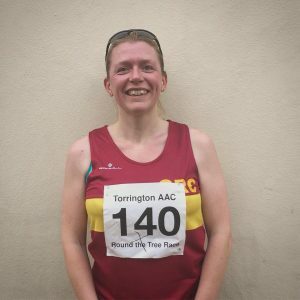 Emma Cunnington was diagnosed with Multiple Sclerosis just over three years ago and had to stop running for sometime, but recently came back to run with the club and was thrilled to complete her first race in years in 1.02.26, not far off her old times for 10k. 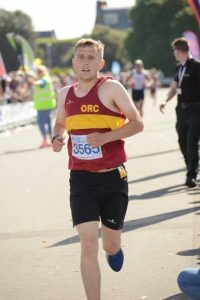 Other ORC times; Mike Westland; 50.47, Geraldine Walter; 53.41, Chris Fullford Brown; 55.16, Liam Keen; 58.51, Vicky Hall; 1.00.21, Rachel Haydon; 1.00.25, Louise Dennis; 1.03.27. Jane Richardson chose a different 10k at the weekend by taking part in the Ivybridge 10k on Saturday evening. This spectacularly scenic race starts in Ivybridge Station Car Park and finishes at Ivybridge Rugby Club. The course is relatively fast, despite the steep hill from Bittaford to Moorhaven. The last 6km of the route are almost all downhill, making for a fast 2nd half of the race. Jane had a good run finishing in 1.06.13. 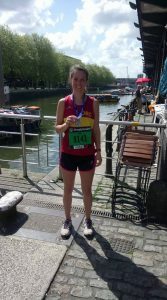 Further away, Abi Colton ran the Bristol 10k and was pleased to finish in 52.24, well under her predicted time. Abi is currently living in Bristol so is unable to train with the club but is still very much a member and happy to fly the flag for ORC there. Two more members took up the Dartmoor 600’s challenge recently, both of them completing this tough run of beautiful days when the moors were at their best. This self-navigating challenge to run all five of Dartmoor’s peaks over 600m involves an 18 plus mile route with over 3,700’ of ascent depending on the route chosen. Gill Spinney had her dogs as companions when she ran two weeks ago, while Robert Richards completed it this weekend on his own as preparation for his up and coming Ultra-Marathons. Last Friday evening Okehampton Running Club held its annual Awards Evening at Okehampton Golf Club. This celebration of the achievements of the runners throughout the year gives the members the opportunity to vote for nominees in different categories and trophies are awarded to the winners. 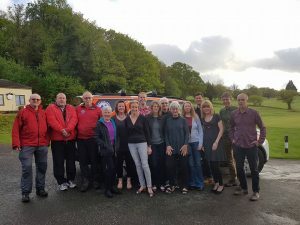 This year it was decided to hold the AGM at the same time to give members a chance to hear what the committee has been doing for the membership throughout the year and a chance for them to have their say in what will be happening in the future. Two Honorary posts were to be elected with Claire Sprague stepping down as Secretary and Andy Vallance from Club Captain. Ruth Bushell and Jane Jackson were duly elected to fill these posts. Club Chairman Jeremy Tandy proposed three resolutions; 1; regarding the formal establishment of the ORC Youth Section, 2; amending the ORC Constitution to define junior members as those under 18 in line with England Athletics and 3; the publishing of a formal safeguarding policy, including the election of Anne Binns as safeguarding officer. These resolutions were unanimously voted through. Following a buffet meal the awards were then presented to the members by Jeremy and certificates covering six different race distances were awarded to those who had achieved certain standards in them. Highest Female Achiever; Mags Jarvis, Highest Make Achiever; jnt Rob Kelly and Roger Voaden, Hardest Female Trainer; Jackie Dawes, Hardest Male Trainer; jnt Rob Hicks and Rob Kelly, Most Improved Female; Jo Bradford, Most Improved Male; Ed Dumpleton, Best Newcomer; Tom Andrew, Coach of the Year Female; Tracey Mills, Coach of the Year Male; Geoff Hill, Member of the Year; jnt Claire Sprague and Jane Jackson. The final presentation was for the Marilyn Cooper Memorial Cup, donated to the club in memory of Marilyn by her family following her death two years ago. This is the only trophy that is not awarded on votes, but goes to the female member who has raced the most miles in a year. This year’s winner was Jo Turner who had clocked up over 200miles in various ultra-marathons and races done in preparation for them. Finally a raffle was drawn with the proceeds being donated to North Dartmoor Search and Rescue who help out on some of the clubs summer races, and whom the club members know will be there for them should an accident happen while our running on the moors. The club would like to thank Williams Oseopathy, Clive Lacey sports therapist, HPT Sport Bude, Beauty by Design, Jo Bradford and Vanessa Moys physiotherapy for kindly donating vouchers as prizes for the raffle. With a Bank Holiday weekend looming there is an expectation that the weather will go rapidly downhill, but this wasn’t the case last weekend when blue skies and soaring temperatures made for lovely weather for the tourists but a bit hot for running. The first race of the weekend however was held on Friday evening when the traditional Torrington Round the tree race took place. This is a multi-terrain challenge starting and finishing in Great Torrington town square and is part of the towns historic May Fair celebrations. At just 2.7 miles it has a fast and furious downhill first mile but a sting in the tail with an uphill finish. 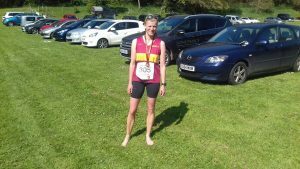 A lone Okehampton runner, Jo Page, took part in this race and was very pleased to finish 2nd senior lady and 5th lady overall in a time of 22mins14secs. 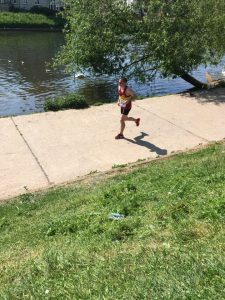 By Sunday the weather had reached temperatures more akin to an August Bank Holiday and the Okehampton runners that took part in the very tough Hartland Heartbreaker found it uncomfortably hot. There are two races here, the 18.5 mile Heartbreaker and the 9 mile Heartache which is the first loop of the longer race. Both take the runners from the start at Hartland Abbey through woods filled with bluebells and wild garlic and then out onto the stunningly beautiful coastline, following the steep coast path northwards, with its brutal ascents, steps and descents to Hartland Point before turning back inland through green lanes and tracks and returning to the Abbey. This is the finish for the 9 milers, while the ones doing the longer route wade through a river to then follow a path on the opposite side of the valley out to the coast again to do an even tougher second loop southwards. Here the coastpath is only inches from vertical drops in places and cruelly runners can be seen tantalising close, but often well ahead due the twisting nature of the course. Other notable points were an ascent called the Wall, another called The Slog and a section so steep ropes were supplied to pull yourself up. The compensation for all this effort is the spectacular scenery, the beautiful woods and the sangria, Prosseco, Tequila and beer that are on offer at several points! On such a hot but glorious day the toughness of the race is soon forgotten by the runners once the finish line is crossed but the memories of the wonderful scenery and superb marshals stay with them. Four ORCs took part in the Heartache with Emma Dean the first in 1hr 43min to finish followed by Jane Jones in 1hr 53mins and then Suzanne Gratton in 2hrs 12mins and Kerry Tyler in 2hrs 22mins, all very glad to not be facing a second half. Two of the three 18 milers, Jane Jackson and Christine Fritsch, were using this as part of their training for the upcoming Tsunami Marathon and their following Lakeland Ultra and were running with a lot of training miles in their legs. For Mags Jarvis this was a step into completely unknown territory, having never raced further than a half marathon before and she coped well despite not liking the heat. All three ran well in the conditions with Mags and Jane both in 4hrs 25mins, the oldest ladies in the race, crossing the line together, and Christine in 4hrs 26mins not far behind having been waylaid at the last cocktail stop just before the finish! Tip here is never have a drinking competition with Christine, only one minute to knock back a cocktail! 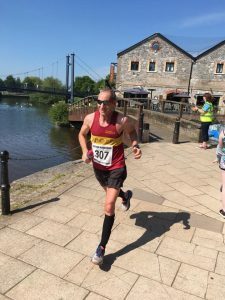 Roger Voaden completed another weekend of back to back marathons when he ran the Plym Trail marathons on both Saturday and Sunday. The course is a double out and back along the track of an historic railway in the Plym valley, with some lovely scenery along the way. Roger had completed this duo of marathons once already this year and repeated his success again this time, despite the heat, coming 2nd on the first day in 3.22.00 and 3rd on Sunday in 3.22.55 but winning the overall weekend on aggregate. Error: Error validating access token: Session has expired on Saturday, 20-Apr-19 03:20:42 PDT. The current time is Monday, 22-Apr-19 11:11:26 PDT.